Mammogram? Check. Pap test? Check. Blood pressure? Check. Hearing and vision? Check. Screenings are an important part of maintaining women’s health. They can detect disease when it’s most treatable and prevent serious problems, according to Dr. Lili Lustig. She is a family medicine specialist at University Hospitals Cleveland Medical Center in Ohio. To get the right screenings, talk to your doctor, who will take into consideration your age, overall health, family history and current health concerns. “Women ages 30 to 65 who have a normal Pap test and a negative HPV only need to be re-screened every five years,” Lustig added. It’s also important to get screened for sexually transmitted diseases (STDs). They may not cause symptoms, meaning you can pass them to your partner or, if pregnant, to an unborn child. If you suspect you might be pregnant, getting tested early sets you up for good prenatal care, including eating well and avoiding drugs and alcohol. When it comes to mammograms, the current recommendation is to get your first at age 40, and follow-ups annually after that. At age 18, start checking your skin monthly for suspicious moles or color changes, especially if you’re fair-skinned or have high levels of sun exposure. Full body yearly skin exams with your dermatologist should begin at age 40. A colonoscopy can detect and remove symptomless polyps that can develop into colon cancer. You should have your first one between ages 45 to 50. The results will determine when you should have your next one. 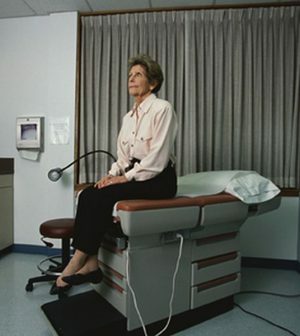 The general guideline for bone density tests is to start by age 65. But if you have a thin build or other risk factors, start at age 50, Lustig said. Have a hearing test every 10 years until age 50, then annually after age 60. Have a baseline eye exam at age 18, then every two years until age 60, unless you have a health problem such as diabetes. Beginning at age 61, get your eyes checked every year. Regular blood pressure screening is another important health check. As for cholesterol, the American Heart Association recommends a baseline test at age 10, then testing every four to six years for people at average risk of high cholesterol. The U.S. Office of Disease Prevention and Health Promotion has more on health screenings.